We are Lumbar Traction Malaysia PLT ! 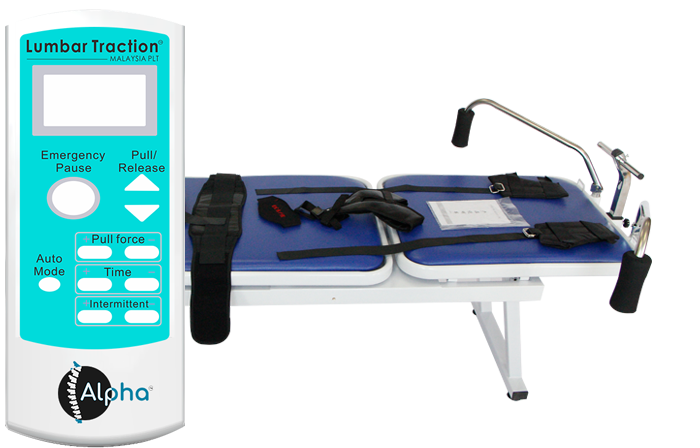 Lumbar Traction Malaysia PLT is a company specializing in the design, manufacturing, sales and distribution of Lumbar and Cervical traction devices, for home use. Quality, safety, ease of use and effectiveness is what we strive for in all of our products. Our products are jointly developed by Manufacturer, Patients and Medical Professionals. Our founder has spent more than a decade in China, managing his own company and has experience in numerous industries including electronics, plastics, metals, apparels, packaging etc. Almost 99% of business dealings are with US and Western Europe markets. Therefore, quality control and assurance is a prerequisite and a deeply rooted culture here are Lumbar Traction Malaysia PLT. At a young age, our founder experienced lower back pain. He found no relief from any treatment received. This included Western physicians, Chiropractors, Traditional Chinese Medicine (TCM) physicians from both Malaysia and China. He tried everything from oral medication, injections, acupuncture, joint manipulation, physical therapy and exercises. It was until the lower back pain became unbearable and severely affected day to day life that our founder discovered the incredible benefits of Lumbar Traction beds. Lumbar and Cervical Traction treatments have been around for 1000 years. It has been commonly performed in the old times using pulleys and weights. Although somewhat effective but the traction force is not easily measurable. It is also unsafe and cannot be operated alone. Effectiveness is greatly reduced if traction force is not up to par. This is especially true when there is a slip between the harness and your skin/ clothes and traction force is reduced without you knowing. 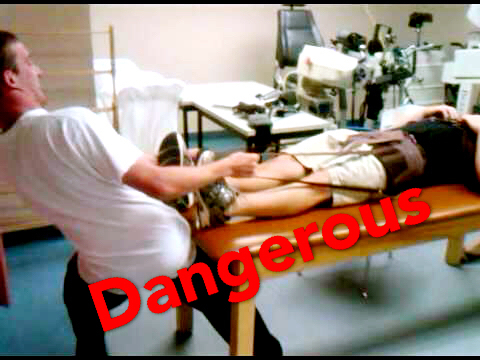 There are of course many dangers and risks as everyone does it differently and there is no standard. Manual versions of traction beds are less expensive but very difficult to operate. The tables are usually very narrow (30cm wide). We found that the most comfortable width is around 60cm. The table does not split. It is a one piece table instead of 2 pieces separating. This means there is traction between the bed and your back, which poses several problems. 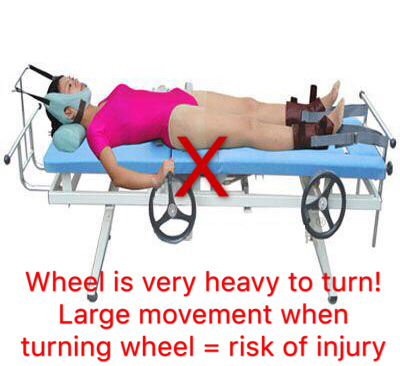 Also, you need to pull/push or turn very hard to get the desired traction force. Imagine manually adding dozens of kilos of force, while lying down with one hand. Its extremely difficult even with 2 hands. It is also not recommended to make large movements while using the traction device so this is absolutely not recommended. Portable traction devices simply do not work. They are not strong enough to withstand the traction force on your lower back. They present even more issues than the manual traction beds and they break very easily. 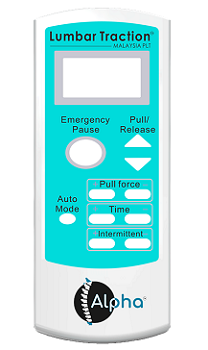 There are a few electronic remote controlled lumbar traction beds in the market but they are very unreliable. They only have an up and down button with zero safety and display features. There are no traction force compensation. Traction force compensation is VERY important. It allows for force compensation when there is a slip. In other words, if you select 40kg force, the traction device will maintain the force even if there is a slip and force is reduced. Most remote controlled models does not have a display screen. All of the remote controlled models with display screen that we researched are NOT accurate in the force they display. The motor sensors are extremely inaccurate and if damaged, can be dangerous to the user. 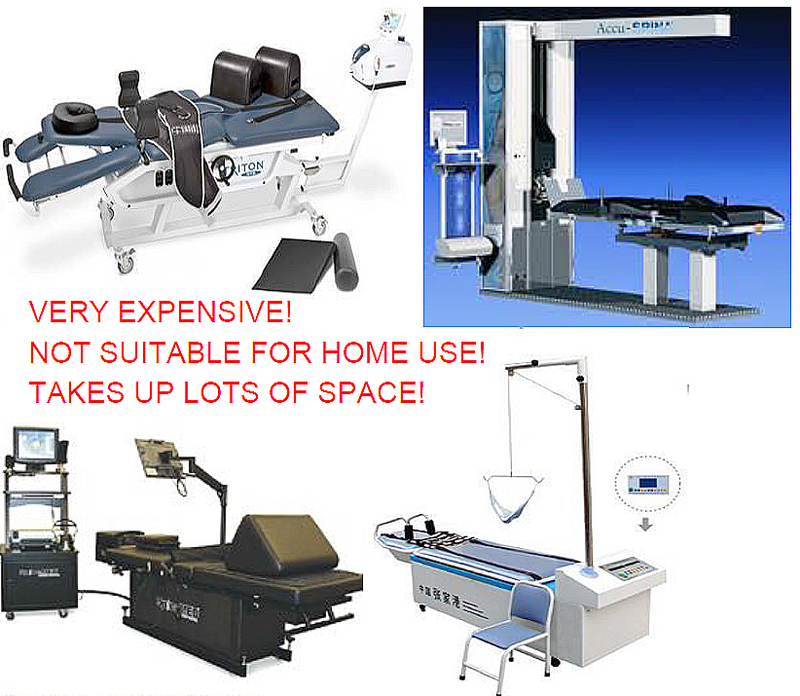 In Malaysia, the only reliable choice for lumbar and cervical lumbar traction beds is NOT for home use. It costs around RM30,000 and is for hospital use with many features that we do not need (e.g Patient records and preset settings for different patients). It is also extremely big and bulky. Takes up a lot of space at home even if you can afford it. Just look at these prices from a world renowned B2B website. Its been said that the best deals are here. Note that prices are in USD and does not include shipping. Warranty and service is pretty much empty talk as the cost of shipping back and forth is too high. With these findings and a burning passion for traction beds, our founder vowed to solve the above issues and develop a one man operated, remote controlled with smart display features, safe, comfortable, reliable, accurate and affordable Lumbar & Cervical Traction bed. Most importantly, it must be suitable for home use. No one wants to visit a hospital every day, queue up, pay bills and then go home. The back and forth trip to the hospital itself will not be good for the condition of your neck and back. The result was the birth of our flagship model, The Alpha. 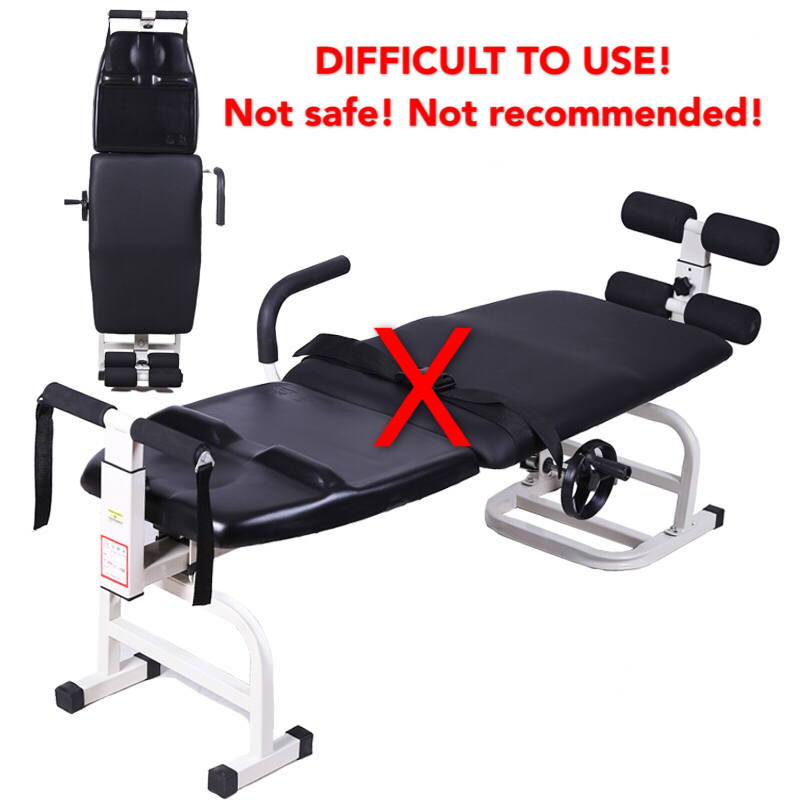 It is truly the best home use Lumbar & Cervical Traction Bed that the world has seen. Being Malaysian, our founder decided to make Malaysia the first stop in our international expansion. Copyright © 2016-2017 Lumbar Traction Malaysia PLT.